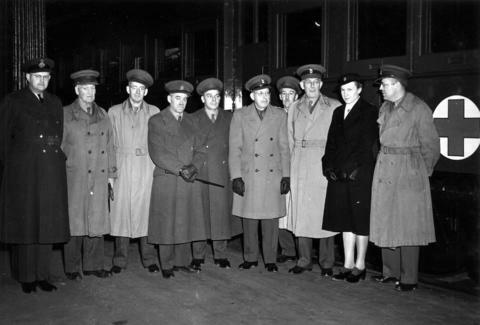 Item is a photograph of military and medical personnel taken on the occasion of a trip on a C.N.R. hospital train, visible in the background. Purple stamp on verso: "-Please credit- / Canadian Army Photo / (Printed in Canada)". Copyright: Government of Canada; expiry: not determined.